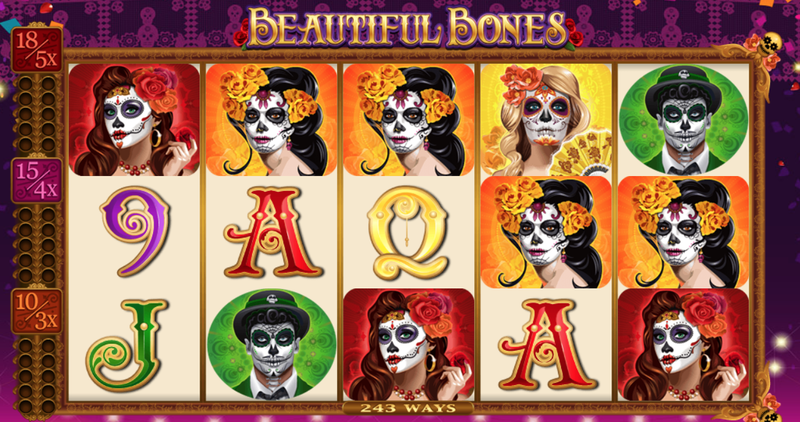 Beautiful Bones by Microgaming is a 5 reel and 243 ways to win slot. It is based on the Mexican Day of the Dead usually celebrated on the same day as Halloween. Features in this slot include a Wild Spin Again feature, a free re-spin, scatter symbols, wilds, a Free Spins feature, multipliers and more. There are up to 30 spins up for wins with different multipliers available for different free spin rounds. We have 10 free spins plus a triple multiplier, 15 free spins plus a 4x multiplier and 18 free spins plus a 5x multiplier. Its unique Wild Spin Again feature involves the central symbol part of a 3 of a kind win turning into a wild and being held in place for a free re-spin. Play on any of your devices for stakes starting from 30p to £15 per spin. Or if you're new to Easy, come and learn more. Microgaming is one of the oldest and most respected online betting companies. They’ve released more than 600 games over the past 2 decades in operation. When they started out in 1994, they launched their first casino in that same year. It still uses the same software for more than 20 years later. That’s proof of just how effective and dependable Microgaming products are. The slot is based on Día de los Muertos, a Mexican holiday where people offer the dead their favourite possessions and honour them with songs and prayers. The game includes some high-end visuals and a design which includes aspects of traditional culture. Deposit today and enjoy all of this as well as some classic Easy Slots promos. Symbols on the reels include A, J, K, Q and 10 playing card values as well as 2 males and 3 female painted skulls. The females land on the 3 middle reels (the 2nd, 3rd and 4th reels) and can land fully stacked while also boosting your winnings. The wild symbol substitutes for all other symbols apart from the scatter. Wild Spin Again feature -This feature is triggered when a 3 of a kind winning combination is formed. (This could be either vertically or horizontally). The central position of the win turns wild and a free re-spin is awarded with the wild staying in place. 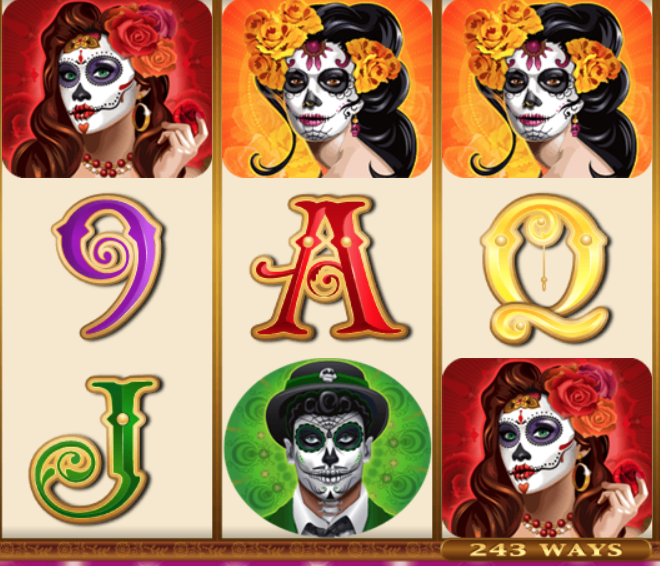 Free Spins feature- The Free Spins feature is definitely a highlight and is activated when you land 10 sugar skull scatter symbols anywhere on the reels. The sugar skulls can hit all the reels and are collected. Once you get 10, you receive 10 free spins where all the wins are tripled. If you collect 20, you are awarded 15 free spins plus a 4x multiplier. If you collect 30, you receive 18 free spins plus a 5x multiplier. It's up to you to play the feature any time you achieve a sugar skulls milestone.